How does NCARB Serve the Small Firm Architect? The National Council of Architectural Registration Boards is a nonprofit organization made up of architectural licensing boards of 54 states and 8 rerrirotires. While each jurisdiction is responsible for regulating the practice of architecture within its borders, NCARB develops and administers programs for licensure candidates and architects throughout the nation. Our community of small firm architects is filled with people with very mixed feelings toward NCARB. Many see the benefits that NCARB provides all architects, while some question the process and procedures required by the organization. Still others have questions about whether NCARB is even relevant in our profession. Do small firms see any benefit to membership and certification? In short, our community of entrepreneur architects have many questions for the leaders at NCARB. 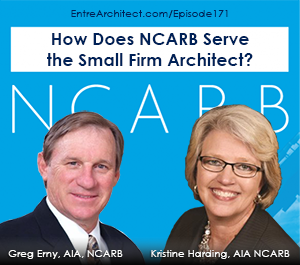 This week at EntreArchitect podcast, Mark R. LePage asks NCARB’s Kristine Harding and Greg Erny, “How does NCARB Serve the Small Firm Architect?“. Kristine Harding is an architect based in Alabama and the current president of NCARB. Greg Erny is a small firm architect out of Nevada and the incoming NCARB president. Kristine grew up in Texas where her mother often used graph paper to draw floor plans. One day as she stood in the kitchen, her mom told her to be an architect. She took drafting in high school and fell in love with how they focused on buildings instead of just mechanical drafting. She studied architecture at Rice University and her passion grew. Eventually she ended up in Alabama where she worked for a firm who had a great transition plan and one day took over that firm. Greg’s from a small town in rural Indiana, and one of his earliest memories of recognizing the world of architecture was seeing the craftsmanship of his grandfather’s barn. He was involved in and around construction sites growing up and began down the architecture path in high school. He persevered through the five year program at Ball State University. After earning his license and working for a few firms, he branched out to start his own firm and has been there ever since. How did you get involved in NCARB? Kristine was appointed to the state registration board in the state of Alabama. At that point, she was a member of NCARB. She served on the board for 12 years and came up through the leadership to ultimately reach the board level. Greg became involved with his local AIA chapter. He became the president of the chapter and then the president of the state, and, when a spot on the state board opened up, he took it. He got more involved with NCARB on the regional level and found a home in the organization. In 1919 at an AIA convention in Nashville, 13 states got together and thought it would be good to have an association to facilitate licensure. It’s grown to all 50 states and other jurisdictions that work together to help reciprocal licensure across state lines as well as promote education experience and examination for architects. The reciprocity benefit that NCARB has brought to architecture has allowed architects to practice across state lines. What specifically does NCARB do for small firm architects? For small firms, there’s an experience program to identify young professionals that are seeking experience. For young professionals, that’s a great environment. Greg has a small firm of four people, and he’s found benefit through the programs of experience and education. In looking at someone’s credentials, they need to be able to do everything since there are so few people doing the work. Small firms want people with broad backgrounds. What’s different about NCARB Portfolio, the AXP and the intern role? All of the programs are around one word. The ARE is the examination directory. NCARB has looked at rebranding to follow that, and has found that AXP falls more in the experience program. A task force looked at the word “intern” and found that it’s not a term that’s regulated. Because of that, it wasn’t something that NCARB needed to define. If a firm wants to call someone a project manager or a senior designer, that’s great; just make sure you aren’t using a term that is legislated in your state. There may have been people who stepped away from the profession for one reason or another who have a lot of experience, but they can’t step away from that to get more experience. You can use the AXP portfolio to document your previous experience. At NCARB, within 6 months you need to report your experience. The main reason is because the sooner it’s documented, the fresher it is in your mind. For up to 5 years, you can receive 50% credit. NCARB also has an app that you can use to document your experiences as often as you want. The Integrated Path to Architecture Licensure is a new program where education, experience and testing are being offered through seventeen university programs across the country. If you’re in that program, all the components of education, experience and testing that you would take on a traditional path would be completed during your time there. They’re set up with the opportunity to accomplish all of realms while you’re there, though it doesn’t guarantee that you’ll be able to be licensed when you graduate. Is that the future of architecture licensure? It’s more of an alternative. NCARB recognizes that you’ll have to be a very focused person to do it this way. This will be very successful to those who want to take the exam before life gets in the way. In the next year or so, NCARB will start getting metrics of the success to figure out the market for those who do want to move forward with this kind of program. What benefits are there for those who don’t need multi-state licensure? In the Monograph series, NCARB provides resources on health, safety and welfare continuing education to certificate holders. Additionally, NCARB helps people pursue renewing their licensure. They’re in the process of creating some software along those lines and hope to launch that in the next few years. As you gain education, NCARB can keep your certifications to help with renewing licensure. Can you use construction experience toward lisensing? Within the existing programs of NCARB, construction observation and work counts toward part of the experience requirement. One of the advantages of being in small firm is drawing in the morning and dealing with site issues in the afternoon. You’re constantly getting exposure to construction, and therefore gaining hands on experience. How are you working to make the NCARB process smoother? There used to be a bad customer service perception, and they’ve worked over the previous years to streamline things and improve the service. Anyone who’s been involved recently will see great improvement and find that everything is at the tip of your fingers and things can be moved very quickly. 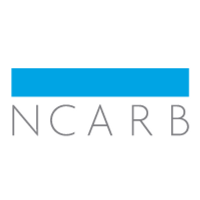 NCARB also has a brand new website that responds faster to what the user needs. What’s in the future for NCARB? NCARB is looking at where regulation is going in terms of software and individuals themselves. As they wrap up the first 100 years, the immediate future is looking to strengthen the mentorship program to bring experienced practitioners on in a more integrated way. The goal is to be a better resource for those architects who are utilizing them to get through the exprience component of the licensure process.